As someone for whom being able to conceptualize things is very important to thinking and feeling about them, and who also has both a practical and theoretical interest in relationships, including non-mainstream relationship structures, I spend a lot of time thinking about ways to conceptualize relationships. I also repeatedly run into issues that show me holes in various existing conceptualizations. Zack was trying to explain to me that he likes one book series more than another because of the lack of friendships in the second, and we spent a bit of time with me arguing with him and him trying to explain because I couldn’t figure out what he was actually talking about. The moderator of a blog on alt relationships stated that they don’t understand the difference between a queerplatonic relationship and a very close friendship. I for at least the second time ran into the problem of not knowing how to refer to a significant-other relationship that is sexual but not romantic. Etc. At the moment, the conceptualization of relationships that works best for me in terms of capturing everything I want to be able to capture is a combination of two axes and a tag system. The two axes are used to plot two measures of significance: 1) How emotionally important a relationship is to you, and 2) how large of a role this person has in your life. Emotional importance runs from ‘complete strangers’ to ‘focus people’, with focus people being the term I’m using for ‘most important people’ – people who would be your ‘hostages’ for the second task of the Triwizard Tournament, who would be the best targets if someone wanted to blackmail you into something or haunt you with visions of horrors, for whom you would drop everything if they needed you or were in trouble. Role-in-your-life is about time and ‘utility’ – how much do you interact with this person, are they meeting some of your day-to-day physical and emotional needs, etc. My best friend is very emotionally important to me, however I see her about once a year and don’t talk to her much more often than that. Some villains will abandon their right-hand minions in time of trouble, because while these people are practically useful for what they do, they’re not emotionally important to the villain at all. Zack and I used to live closer to each other than we do now. This change decreased our presence in each other’s lives, but did not decrease his emotional importance to me. The tag system covers everything else. Is this relationship sexual? Is it romantic? Is it a Relationship? (I’m using capital-R Relationship to mean the ‘we’re in a relationship’ kind of relationship, wherein this is how the people involved see it and think of it). Is there a legal bond involved? A biological connection? A financial connection? D/s? Is one person in authority over the other? Do they have shared responsibilities? Etc. This allows me to answer the earlier questions. A queerplatonic relationship is distinguished from a close friendship by the ‘+Relationship’ tag. 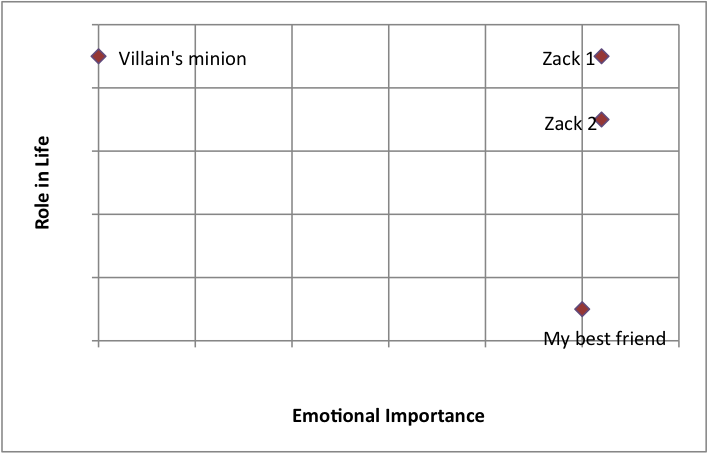 The thing Zack wants in books is relationships that are high up on both axes, but do not have ‘Relationship’ ‘romantic’ or ‘sexual’ tags (in other words, are –Relationship, -romantic, and –sexual). It also allows me to talk about some other things I want to talk about. For instance, I’ve been struggling for a while on how to define ‘significant other’. This gives me a definition – ‘significant other’, to me, is the intersection of ‘very emotionally important’ and +Relationship. Likewise, I now have a definition for what ‘primary‘ means to me – it is the intersection of either-or-both ‘very emotionally important’ and ‘very large role in life’, and +Relationship. So, a life partner can be a primary partner without being emotionally important (as, say, for a sociopathic villain), and a significant other can be a primary partner without having the largest role-in-life (as, say, in a long-distance relationship). Meanwhile, when I talk about culturally conceptualized ‘idealized monogamy’, I mean that in our culture it is considered the right way to do things to have a relationship that’s in the top right corner of the graph (very emotionally important and very large role in your life), that is +Relationship, +romantic, +sexual, and preferably +married, and additionally that no other relationships in your life should be that far in that corner, or have those tags. So – possibly more adjustments to this system as I do more thinking, but meanwhile, this is what I have.